“IN 2006, the final exam paper for physical exercise at the secondary schools in Hungary asked a question: Why is it unadvisable to water the garden plants during midday sunshine in summers? The answer was water droplets function as collecting lenses and focus the sunlight on the leaves, burning them,” said Gabor Horvath, environmental physicist from the Eotvos University at Hungary. An interested Horvath and his colleagues then carried out a survey in which 78 per cent of websites on gardening iterated the same answer. Yet no experiment had ever been conducted on such a seemingly widespread belief. Taking stock of this, physicist Adam Egri led a team of researchers, which included Horvath, from the Eotvos University at Hungary and the Max Planck Institute for Meteorology in Germany to prove the paradox—water can indeed burn plants under the sun. In the first of three experiments, smooth and hairless maple leaves were covered with glass spheres and exposed to sunlight for nine hours, three hours and one hour at a stretch. In the second experiment, smooth, hairless surfaces of Ginkgo biloba and maple leaves were covered with large and small water droplets and exposed to sunlight for varying durations. In the third experiment, surfaces of the hairy and hydrophobic leaves of the floating fern, Salvinia natans , were covered with water droplets and exposed to the sun. Results from the first experiment showed sunburnt patches on the leaves regardless of how long the sun had shined on them. This proves the sun could turn into a source of ignition any time if it has the right medium. Explaining the physics behind it, Horvath said, “The refractive power of a glass sphere is higher than that of a water drop. As the sphere contacts the leaf surface at a tiny point, it has a shorter focal length than, say, a flat object.” This means glass spheres on a leaf are ideal for sunburn. Children burning holes in paper using a magnifying glass follow this principle. In the second experiment the sun could not do much harm. 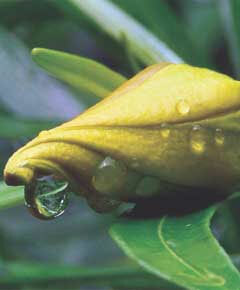 Horvath explained: “The shape of a water drop on a leaf is determined by the contact angle of the leaf surface. That between a smooth leaf surface and a water drop is smaller than 90°, making the droplet flat, lens-like.” Flat droplets focused the sun’s rays way below the leaf and let the water do its job—cool the leaf surface. In the third test the sun’s force came into play. The waxy, water-repelling hair of the fern leaves held the droplet above the leaf’s surface. This allowed for the focus of the sun directly on the leaf, leading to sunburn. “Water droplets held by the leaf hair are spheroid,” said Horvath. Like the glass spheres, spheroid drops are more damaging than flat drops, said the study that was out in New Phytologist in January. If the sun’s rays are properly focused onto an inflammable substance, it can catch fire. Only the medium matters. If a magnifying glass can let sunrays through, why not a transparent drop of water? So does this mean rains could start a fire in dry forests? “We did not find any documented evidence. Although a prevailing belief, we think it is a myth. The damp vegetation reduces chances of a fire—even if the dry matter were in focus of the water drop,” said Horvath. This study does explain the dark patches sunbathers complain about. Moist skin is a good target for the sun to leave behind a few traces.